The Add Plan dialog opens. At the top of the dialog, note the five different tabs which allow you to configure different aspects of the plan. Let’s go through them one by one. Type - There are four main types of plans in OfficeR&D each one of which serves a certain purpose. Private office - Used by companies which will occupy office(s) in your space. Memberships created with this plan will then be assignable to resources of type Private office. Dedicated desk - Used by members or companies which will occupy desk(s) in your space. 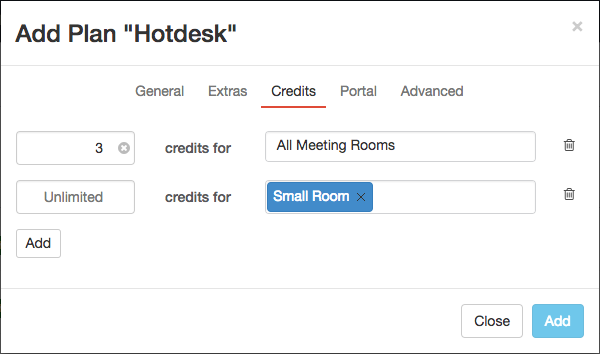 Memberships created with this plan will then be assignable to resources of type Desk. Hot desk - Usually sold to drop-in or frequent flyer members which take the first available desk in your space. Memberships created with this plan are not assignable to any resource. Service - Complimentary or chargeable services you offer in your space like Lockers, Parking spots, Canteen service, Daily coffee and so on. Name - The name of the plan which will be displayed when creating memberships or when people are signing up through the portal. E.g. “Office”, “Fixed desk”, etc. Unique code - A code that uniquely identifies the plan. Can be used in exports and to navigate to a pre-populated sign-up page. Price - Price of the plan. It can be either paid monthly or just once depending on the frequency. month - Plans that will be billed monthly and will recur each month. Assigned to memberships. one-off - Plans that will be billed just once. Assigned to fees. TIP: If one-off is selected some of the options in the dialog won’t be available for configuration. Deposit (applicable to ‘month’ plans only) - An amount which will be held when a membership with this plan is created. The amount will be held by creating a refundable fee. (Optional) Description - The description of the plan. Displayed on the Portal sign up page. Locations (applicable to multi-location spaces only) - The locations in which the plan is available. You can specify the number of day passes which will be granted when this plan is assigned as membership. Applicable to ‘month’ plans only. This section specifies if Meeting room credits will be granted along with the plan. Credits can be either a limited number or set to Unlimited. They are valid for either** All meeting rooms**, a single room or a number of rooms. Configure if the plan is available for purchase through the tenant facing Members portal. You can then go and approve the newly created membership. Allow Cancelation - Specifies if members can request cancellation of the plan they purchased. Available on Signup - Specifies if the plan is available for direct purchase on the sign-up page. Available for members - Specifies if the plan is available for purchase by people who already have accounts in the Portal. Link - Links the plan to the product page. 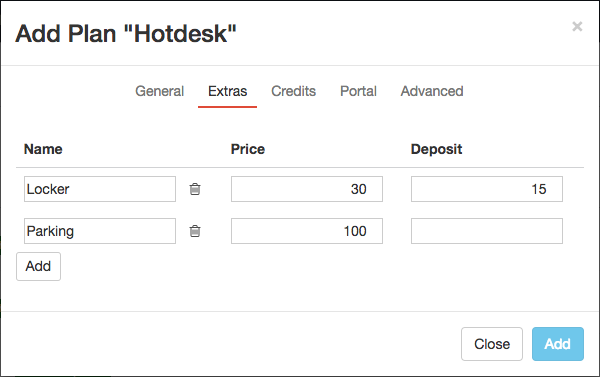 It is used on the signup, checkout page, and the booking dialog. Category - Specifies a category to be used to group plans in different tabs on the Portal. Image - Uploads the chosen image as the plan icon. Account - To which account will revenue from this plan be added. You can manage accounts from Billing/Accounts. Setup fees - Any setup fees that the member buying this plan will be charged for. Here you can select only ‘one-off’ plans created before that. Rate Discounts - Any resource rate discounts that members on this plan will be entitled to. You can manage discounts from Billing/Discounts. Amenities - Add the amenities that are available with the plan. Amenities are provided out of the box, they don't require additional payment and are therefore displayed as part of the overall description of the plan on the members portal and signup pages. You can add amenities in Billing/Amenities. Prorate plan (applicable to ‘month’ plans only) - Whether or not the plan should be prorated when an invoice for a partial month is issued. If the option is not checked the whole amount will be charged. Fixed Price: Deposit ratio - If enabled, automatically calculates deposit amount based on a certain percentage of the price of the plan. Plan Terms - Allows you to link specific Terms and Conditions for this billing plan. Assign membership plans to members.